Dubai Electricity and Water Authority (DEWA) has adopted the Microsoft HoloLens to enhance its operations, improve productivity, accelerate innovation, and provide best quality and fully efficient services to its customers. The move reinforces DEWA’s leading international position and further enables the provision of high quality services. Microsoft HoloLens creates a unique end-to-end solution for DEWA energy plants with 3D representation of real data. HoloLens technology can also be used in confined spaces such as the combustion chambers, with continuous direct communication with the entire team. Documents can be attached and voice annotations added to make technical decisions quickly. The team can confirm that all the upgrades and service work has been successfully completed. 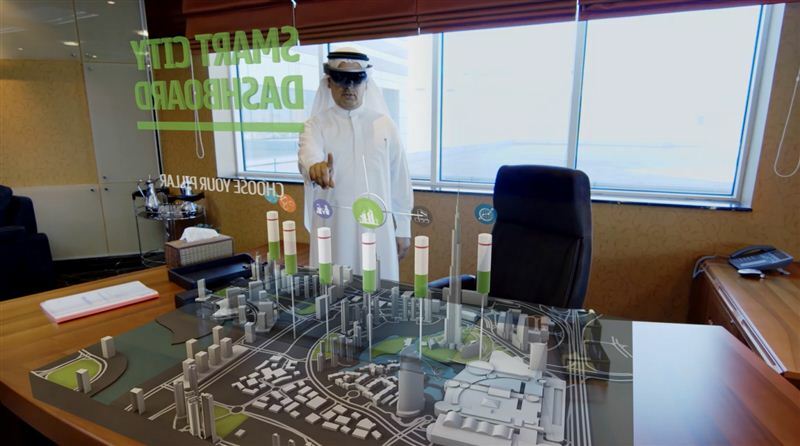 Also, the Microsoft HoloLens provides a holographic and scenario oriented view of the DEWA Smart Grid. DEWA will take advantage of HoloLens to visualize their Smart Power Plant, provide an interactive 3D models for the plants’ equipment, and remote expert assistance; including access to maintenance job cards, equipment, training manuals, and other operating procedures. The HoloLens will enable DEWA to obtain virtual estimations, relating to the remote maintenance of the smart power plants. This ensures faster technical decision making, and helps DEWA manage future demand, while improving energy efficiency and reducing power consumption. “DEWA is keen on following the directives of the UAE wise leadership to adopt creativity and innovation to provide the best services, in implementation of the UAE Vision 2021, and Dubai Plan 2021. We make the best use of the latest technologies in our quest to implement the Smart Dubai initiative, launched by Sheikh Mohammed bin Rashid Al Maktoum, Vice President and Prime Minister of the UAE and Ruler of Dubai, to make Dubai the happiest and smartest city in the world. DEWA takes this responsibility very seriously, and leads the way to support Dubai’s aspiration to attain a leading global position in all aspects. The Microsoft HoloLens technology enhances DEWA’s position, as one of the most prominent utilities in the world to use this technology, which contributes towards stakeholders’ happiness,” said Saeed Mohammed Al Tayer, MD & CEO of DEWA. “DEWA’s core mission is to provide people in Dubai with a continuous and reliable supply of energy and water. DEWA always works on developing its processes by adopting state-of-the-art technologies in all fields. DEWA seeks to take the lead by adopting innovative ideas and solutions, to sustain its position as a role model for other local, regional and international utilities in technological development and digital transformation,” added Al Tayer. “DEWA has always been spearheading innovation in all its operations and processes. We are committed to support them in this journey. We will continue to innovate and enable digital transformation around personal computing, the intelligent cloud, productivity and businesses processes, in order to empower the government to achieve more,” said Samer Abu Ltaif, Regional General Manager of Microsoft Gulf.